when I heard they were going to a sequel. But I couldn’t stay away either. I mean, you gotta give it a shot, right? We find Mike Banning, top security detail for the United States President, still guarding the President. He’s doing well. He has a wife and a child on the way. Of course, you know things are about to take a turn because of this set up, but moving on. Well, the Prime Minister dies mysteriously and because he’s a dignitary and of an ally, the President has to attend the funeral. Along with all country leaders who are alliances. You know how it goes. This spur of the moment, international puts Banning and his superior, Lynne Jacobs, on edge. A security nightmare. But, there is no use wiggling out of it without offending some country so off they go. And of course that’s when the fun begins? I mean, all of the Western Alliances in one location. What could go wrong, eh? Despite my skepticism, I liked it. It’s predictable having your run-of-the-mill terrorist-revenge plot, but that’s what makes it fun! I’m always curious to see what directors and script writers do with this kind of plot line, you know? How do they add their signature on something that’s been done before. And I like what Najafi et al did with it. My first thought watching the plot unfold was “no way security would do that” but the second thought I had was “hm, important dignitaries all in one place? That’s a strong motive for attack.” Of course, it could be a worthless effort. I mean, you have 40+ countries each with their own security and the terrorist get through? But, you can’t rule out possibility, even if a slim chance. So I like how they did it. And I like seeing the plot unfold on the international stage and how our hero manages those challenges. It was fun to watch. You can’t argue the talent of Gerard Butler. He did an excellent job in this one, though I can’t help but feel he’s been type-casted into that “save the day” hero role. It works for him, but … I don’t know. It’s not necessarily a bad thing. It’s just … a thing. 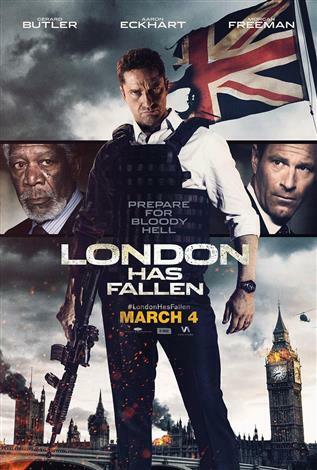 In addition to Butler, Aaron Eckhart is back as well as Angela Bassett and Morgan Freeman. They all do a wonderful job bringing their character to life. I have to say, though, my favorite character was MI6 Agent Jacquelin Marshall played by Charlotte Riley. She was awesome! The cast did a good job and I am happy most of the original cast reprised their roles. Let’s talk camerawork and final product. On point. I mean, there were some action sequences and certain strategies that stretch the realistic, but it’s a movie and it’s fictional, you now? Camera angles were awesome, CG enhanced the story rather than detract, and transitions moved smoothly through out the story. I don’t really get technical here, but any movie that doesn’t have glaring errors usually passes for me. And I enjoyed the effects Najafi and his team put together to enhance the story. I would definitely watch this movie again. It’s a must see, but I don’t think I’d add it to my personal library. As much as I enjoyed it and as much as I appreciated all aspects about it, I don’t know if I’d dish out the money to add. It’s mainly because it’s stuck at enjoyable. It was over the top. It was, an “OMG did that just happen?” And as mentioned, the plot is somewhat predictable, even though I liked how it was told.